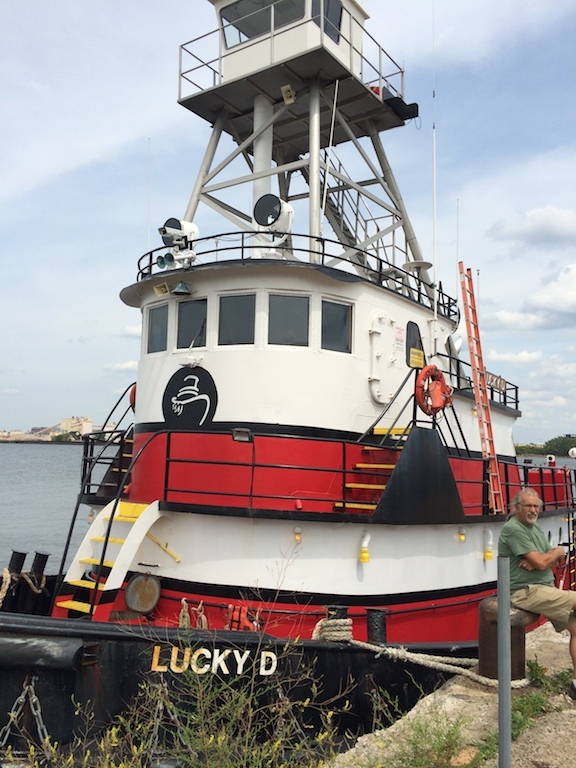 As I arrived at Pier 68 on the Delaware River one afternoon this month to meet with the landscape architect Bryan Hanes and Christina Sohn and Kasey Toomey, two members of his firm’s design team working on a planned new park there, the tugboat Lucky D was just pulling away from the pier. The South Philadelphia pier, once used for importing sugar, hasn’t been active for years–its concrete deck is pierced by weeds and has collapsed at the water’s edge. But the ship, based in Norfolk, VA, was evidence of Philadelphia’s enduring port, today one of the fastest growing on the east coast. The Lucky D regularly moors at the pier while captain and crew walk over to the big box stores at the adjacent Pier 70 shopping center. The tugboat comes in often so that the crew of various barges and other ships on the Delaware and beyond can bulk up on food, clothing, and other supplies, and have a little time hanging out on land. “Everything you need is right here,” says Johnny Rizzo, captain of the tank barge The Chesapeake who had been brought in by the Lucky D on another recent day to do some shopping. Hanes, Sohn, and Toomey, who have been working for the past year year on the design for the park, had come down to the river to meet with Dr. Danielle Kreeger, the science director of the Partnership for the Delaware Estuary, which works to restore natural freshwater ecosystems. Kreeger was seeking a spot for a mussel bed, and thought the pier might make a good home for it. It wouldn’t, she concluded, but the tidal beaches on either side of the pier might. It certainly appears they haven’t. Hanes, in collaboration with TEND Landscape Design, the Delaware River Waterfront Corporation–the agency in charge of the development of parks and trails along central waterfront–and the Pennsport Civic Association, held three public meetings this spring, interactive sessions meant to give residents, anxious for a waterfront park, a strong say in the design. The process, which Pennsport resident (and editor of the neighborhood blog Pennsporter) James Jennings calls “hugely collaborative,” resulted in a design that wasn’t meant to distract from the site itself, but rather to invite mostly passive engagement. When the Pier 68 park opens next summer after a $1.7 million renovation, funded by the William Penn Foundation and others, including Walmart, whose store is so well used by ship crew, you will be able to sit in the grass in the native tree grove just a few feet above the water, fish off the end of the pier, and watch the tide work its way across a water garden formed by a gash cut into the pier. You’ll also be able to sit on one of several benches, whose design is based on the mustaches worn by Philadelphia sailors of the late 19th century. Though the pier is generally in good condition (and thus why it was chosen for renovation), the construction plan also includes extensive structural repair. The gash, which the designers call an “aquatic cut,” is a 15-20 foot long opening in the concrete floor of the pier down to the 1930s-era wooden structure. The designers will use the structure as a plant bed. When the tide rolls in, the cut will fill with water. “By creating a protected place for the tides to come in and out within the pier structure, it sort of recreates the kind of marshy wetland that characterized the Delaware River waterfront before industrialization led to bulkhead edges and dredged shipping channels,” says Lizzie Woods, a staff planner and project manager overseeing the pier renovation for DRWC. “It’s a really creative way to reference the ecologically-driven plans for the rest of this stretch of waterfront within a solid concrete pier structure,” she says, noting that the 2012 Master Plan for the Central Delaware, which guides public and private development here, assigns this lower section of waterfront for a wetlands park. About a quarter mile to the north, Pier 53, which opened last week as a park called Washington Avenue Pier, is also meant to connect users to the river’s natural ecology, albeit in an even more rustic setting (for Brad Maule’s excellent report on Jody Pinto’s sculpture Land Buoy, installed there, click HERE). Both Woods and Hanes stress that the overarching goal in transforming delinquent shipping piers into parks is to provide a variety of forms, uses, and experiences along the river. Pier 68, they note, is the only formal park on the southern waterfront where fishing is allowed. In form, it’s substantially different from Washington Avenue Pier, which doesn’t invite lingering. While you can wade into the river there and climb up to the top of Land Buoy, at Pier 68 you’ll be able to linger for a long picnic or a languorous morning of fishing. Some community members and planners had also hoped that Piers 53 and 68 would include a boat or kayak launch, but proximity to the shipping channel made this impossible. Still, the shipping channel is what lends this future park its visual appeal. More so, it quite powerfully exposes a layer of Philadelphia life that’s been mostly hidden for a half a century, since Interstate 95 locked away the waterfront. 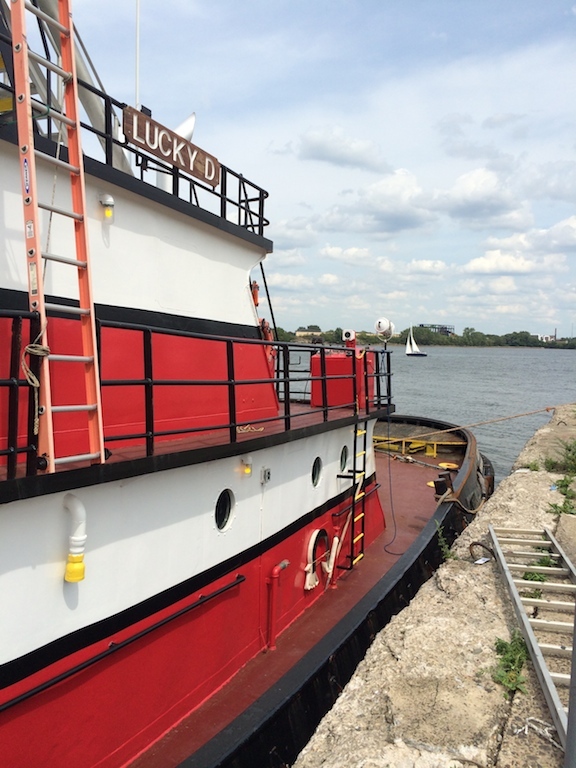 The barge captain Rizzo says that security regulations make it difficult for crew members to come ashore. At Pier 68, where access is easy, barges change crew and sailors get to tell their tales to landlubbers like this reporter. “It’s almost like I need an act of Congress to go shopping,” says Rizzo, noting the cost and difficulty of navigating security apparatus at the various shipping terminals on the east coast. “Here,” he says, showing me the toys he bought his granddaughter at Ikea, along with a French press and serving platters, “if someone needs a toothbrush or new underwear or a pair of shoes, it’s so convenient.” Hanes and DRWC officials say they would like to continue to accommodate the Lucky D and other tugboats, but caution that they haven’t yet fully explored the practical implications of doing so. On Pier 68, Hanes’ firm, which is also responsible for the design of the first phase of the Reading Viaduct Park, as well as Sister Cities Park and much work along the Ben Franklin Parkway, sought to divide the 150 foot long pier into activity zones delineated by grade and materials, so that the space will feel much larger than it really is. 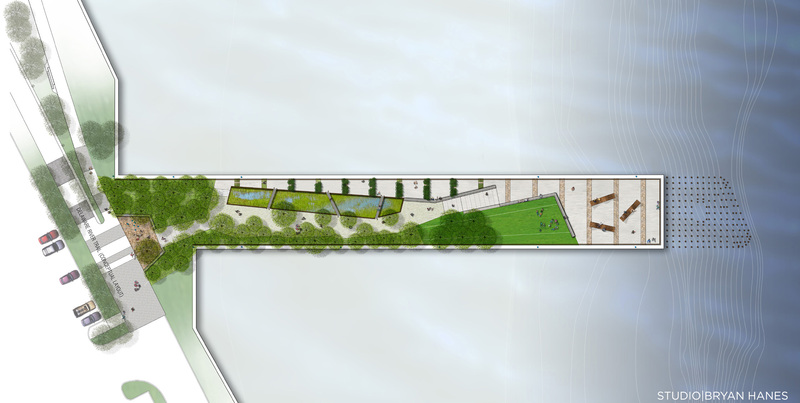 Present plans indicate the use of high quality materials for the walkways and benches, including a soft granite lip to the lawn area that will also be used for seating. While designers have enclosed the aquatic cut with a partial wall–an unfortunate necessity, perhaps–they’ve also built walkways across it so you can literally stand over the river as it rushes across the water garden. This is the kind of sensual experience that belies the profoundly coarse and bewildering experience of shopping at Walmart or Home Depot next door. Pier 68 is one of four abandoned piers adjacent to the Pier 70 shopping center. For years, hundreds of cats (fed by a Walmart employee) inhabited the thick meadow and wetlands along the shore, south from Pier 53. In 2011, the DRWC completed an ersatz bike trail, which now connects the Sugar House casino, at Frankford Avenue, to Pier 68 and the wild Pier 70, just adjacent, where the DRWC’s control of the waterfront cedes to the Port of Philadelphia. The walking and bike trail ended at the shopping center and cyclists and pedestrians hoping to reach the piers had to use the center’s outer drive. Often, the gates to the shopping center would be closed or the drive crowded with idling trucks or buses. Now, that too will change. Simultaneous with the reconstruction of Pier 68, the DRWC will officially extend the trail from Pier 53 into the shopping center, to terminate at Pier 68. Woods says the trail, which will open sometime after the pier park, “will contribute to a more humane environment” in and around the shopping center. However, she notes that the DRWC has no control over the shopping center’s parking lot or traffic patterns coming off of Delaware Avenue. Once you do make it to the park, Hanes says, the payoff is in the surprise reconnection to the city. “One of the things I know about this place is that at first you’re removed from city, it feels like a no man’s land. Then turn around and it’s right back in your face.” From the nose of the pier, the view reveals both the Ben Franklin and Walt Whitman bridges, Pier 53, Penn’s Landing, Race Street Pier, and even Penn Treaty Park. The skyline spills across the horizon. On a nice day, he suggests, you can sunbathe in the afternoon and return in the evening to watch fireworks, all the while ships have come and gone, the tide has risen and fallen away, the magic of place revealed. This is what’s been missing in the life of the contemporary city, says the designer Toomey, referring to the central role the river played for most of the city’s history. “The waterfront should be part of the Philadelphia experience,” he says. To launch a gallery of Pier 68 present and future, click on any of the thumbnails below. Fantastic article , the river keeps growing in the minds of Philadelphians with every section of trail and park. Perhaps the Mural Arts Program could do something with with those blank ugly walls that are within eye site of the trail to further create a sense of being apart from the city. I love watching the ships ove along the river , I’m sure as more parks open others will also enjoy the sites on the river. One interesting little known fact about this area is the presence of two “ghostly marine relics from over a century ago! The relics I’m referring to are the burnt out hulls of two wooden sailing ships. These two schooners caught fire and burned down to the water line over a hundred years ago. They are located right offshore of the southeast end of the Wal Mart shopping center.The two relics are visible at extreme low tide and are still fairly intact since they have been submerged for most of the time! Not only are they visible to the naked eye but can also be seen in certain Google Earth satellite images as well! Yo! Anybody with your wealth of Philly trivia should be a tour guide! Seriously.